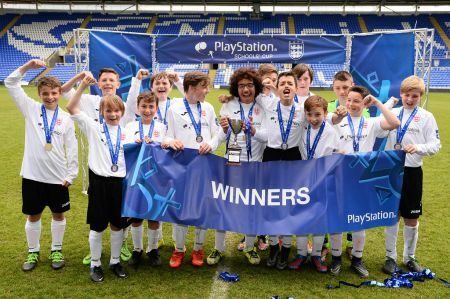 The second day of the ESFA PlayStation Schools’ Cup National Finals at the Madejski Stadium got off to another sunny start ahead of 10 more teams competing for the coveted National Champions title in their respective competitions. You can find Tuesday’s line-up of events below including an appearance from Tottenham Hotspur’s Danny Rose, just one day after he had been named to play in this season’s England Squad in the European Championships 2016! 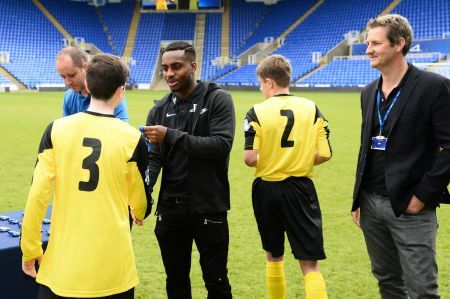 Day two of the festival saw Northampton School for Boys and Thomas Telford U15 Open Schools’ Cup players receive their medals and trophy on the pitch from England star Danny Rose! The opening game of the day was the Under 13 B Team final, which saw Sidcup’s Hurstmere School line up against Stanley High School. 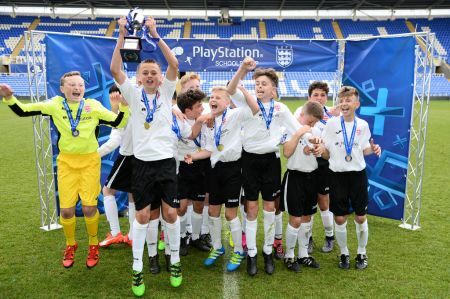 It’s the third consecutive year that Stanley have appeared at the Festival and the very same set of players have already tasted success after winning the Under 12 9-a-side B Team Cup last year. They certainly didn’t hang around either, with striker Marco Ventura scoring two goals in 60 seconds within the first ten minutes of the game. 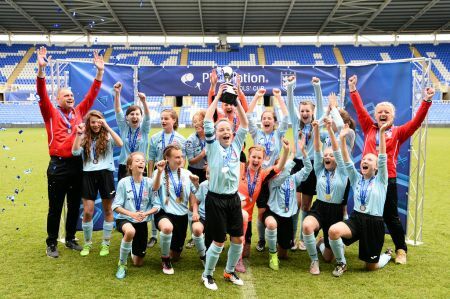 They extended their lead in the second half and despite a consolation goal from Hurstmere to peg the scoreline back to 3-1; they held on and once again lifted aloft a national trophy on the Madejski Stadium pitch. 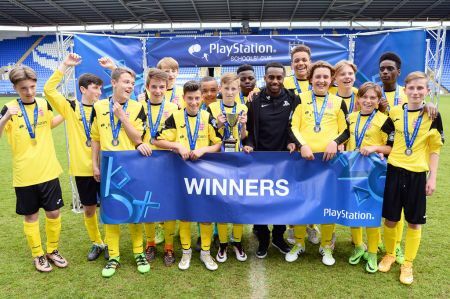 The second game of the day was the Under 13 PlayStation Schools’ Cup final between Whitgift School and Thomas Telford, both of whom had already won silverware yesterday on the opening day. 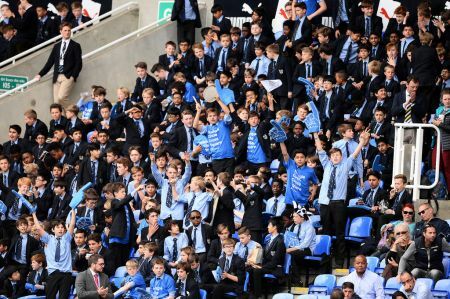 The game was played amidst an incredible atmosphere with a strong Thomas Telford contingent complemented by a 600-strong crowd from Whitgift School. However it was Thomas Telford fans who would once again be cheering after a clinical display saw them get their hands on the trophy with a 7-0 win, the highlight being a hat-trick from Jack Broome. Thomas Telford were back in action next against St Ivo School in the ESFA Under 13 PlayStation Schools’ Cup for Girls, the same two teams that will also contested the Under 14 Girls’ final on day 3 of the festival. On this occasion it was St Ivo who would come up on top with a 3-0 victory, the highlight being a well-taken brace by Lucy O’Brien. St Ivo finished the match hoping to seal a fantastic double in the U14 match on Wednesday. 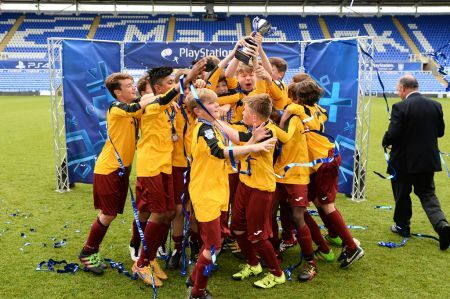 The Under 13 Small Schools’ Trophy, the final game of the day, proved to be a thriller and it contained two goals fit to grace any level. Causeway School edged out Clitheroe Royal Grammar School 3-2 with a 35-yard free kick from Ben Thompson and a long-range effort from Ben Overton stealing the show.